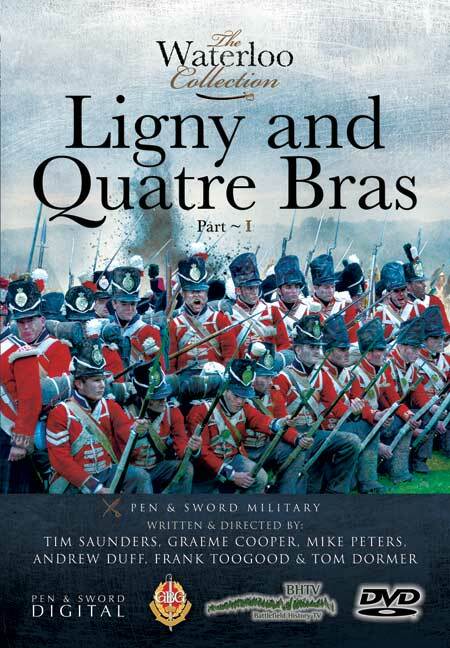 You'll be £16.99 closer to your next £10.00 credit when you purchase Ligny and Quatre Bras DVD. What's this? This is the first part of a suite of programmes that will cover the Waterloo Campaign as a whole, from the concentration of the Armies astride the north eastern frontier of France, through to the Allied pursuit of Napoleon's defeated army to Paris. Over the coming months the Waterloo Collection of four DVDs, with a running time of nearly six hours, will become the most comprehensive portrayal of the 1815 Campaign ever undertaken on film. An introduction covering the political and strategic situation facing both Napoleon and the Allies, along with detail of the opposing armies and their deployment prior to the Campaign's opening moves, will be followed by programmes on the twin battles of Quatre Bras and Ligny. Waterloo itself will be covered in five programmes each taking a detailed look at one of the recognised phases of the great battle. These are the attack on Hougoumont and its epic defence by the Guards, D'Erlon's infantry attack and the famous charge of the Union Brigade, the fight for the farm of la Haye Sainte in the centre of the battlefield, the final French cavalry attack on the battered British line and the final assault by Napoleon's Imperial Guard and last but not least the arrival of the Prussians at Plancenoit. In the concluding part the battle of Wavre and the aftermath of the great battle, which culminated in Napoleon's surrender and exile in St Helena, will be covered. Included with each programme will be vignette's on an aspect of Napoleonic warfare; weapons, clothing and equipment and, of course battlefield tactics. The collection of programmes will be accompanied by detailed orders of battle, maps and battlefield tour notes. For the first time a Mini Guide will be included with each programme for downloading to most types of modern mobile phone or PDA. This will compliment both the programme and the printable material for the battlefield visitor who likes to travel light. Military historians Tim Saunders, Andrew Duff and Tom Dormer along with experts from the Guild of Battlefield Guides (Graeme Cooper, Mike Peters and Frank Toogood) and members of the Napoleonic Association, travel the roads along which the soldiers of the opposing armies marched to the field of Waterloo and to the Campaign's other three significant battles; Quatre Bras, Ligny and Wavre. This is the first part of a suite of programmes that will cover the Waterloo Campaign as a whole, from the concentration of the Armies astride the north eastern frontier of France, through to the Allied pursuit of Napoleon’s defeated army to Paris. Over the coming months the Waterloo Collection of four DVDs, with a running time of nearly six hours, will become the most comprehensive portrayal of the 1815 Campaign ever undertaken on film. Military historians Tim Saunders, Andrew Duff and Tom Dormer along with experts from the Guild of Battlefield Guides (Graeme Cooper, Mike Peters and Frank Toogood) and members of the Napoleonic Association, travel the roads along which the soldiers of the opposing armies marched to the field of Waterloo and to the Campaign’s other three significant battles; Quatre Bras, Ligny and Wavre. The Pen and Sword Waterloo Collection DVD’s at £15.99 have been absolutely great. I have to say, that I cannot find fault at all in the presentation. I was truly hooked to the silver screen as the various scenes were played out by the excellent re-enactors of the Napoleonic Society which all take place whilst the historians add their commentary. The DVD brings the battle to life with the story being set in the fields of fight, with the colour and detail of uniforms and equipment worn by the living historians. This is both entertainment and historical knowledge that will be enjoyed by all ages, from the total novice to the knowledgeable enthusiast and historian. Highly recommended. The general approach is nicely low-key, with a mix of direct narrative and discussions between various presenters. The mix of experts means that each army gets a fair mention - in particular the Dutch army which is often dismissed or ignored, but that actually performed rather well at Quatre Bras, where it held up Nay all morning and most of the afternoon before British reinforcements finally arrived. Part One provides a background to the campaign, looking at Napoleon's plans and the British and Prussian responses, before moving on to examine the various armies involved in the fighting - the British (with many German troops), Dutch, Prussians and French. Part Two looks at the narrow Dutch and British victory at Quatre Bras, part three at the narrow French victory at Ligny. The presentation is low-key but informative. The expert narrative is supported by film of the annual Waterloo re-enactment, and is supported by some clear maps. This is an informative, well presented and gimmick free documentary. The DVD offers the viewer a fair summary of the actions in what amounts to a battlefield tour, whichm, given the price of the DVD compared to the cost of anctual battlefield tour, is good economy. In summary, a promising start to the series. A marvellous montage of speech and re-enactment. Certainly kept my interest from start to finish and once it was over, wanting more. For everyone interested in the Napoleonic Period this DVD is really great viewing, with so much in-depth analysis from senior historians. It is a very 'watchable' film, in which one is transported from one's armchair to the original battlefield locations.